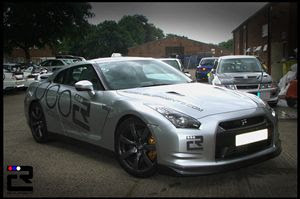 "The new R35 Nissan GT-R makes its British competitive debut at Oulton Park on Saturday July 5. The car, a personal import brought in from Japan by UK tuning firm RC Developments, will be entered in stock trim in the clubman category of the Time Attack series. The series pits an eclectic Gran Turismo grid of cars against the clock – rather than directly against each other – to set the fastest lap time."